The overall goal of SAGA III was similar to the one of SAGA II. In addition, main objectives were to evaluate the spatial and temporal variability of trace gases across the interhemispheric tropical convergence zone (ITCZ), to trace the zonal movement of the ITCZ, to determine halocarbon saturation anomalies and to assess their use in calculating air-sea transfer coefficients, to measure the flux of N2O from equatorial waters, and to compare the results to those made in 1987, an El Niño year. As for SAGA II, the Akademik Korolev was used during this expedition. The cruise began in February 1990 in Hilo, HI, and crossed the equator seven times zig-zagging between 20°N and 15°S before ending in Singapore in April 1990. 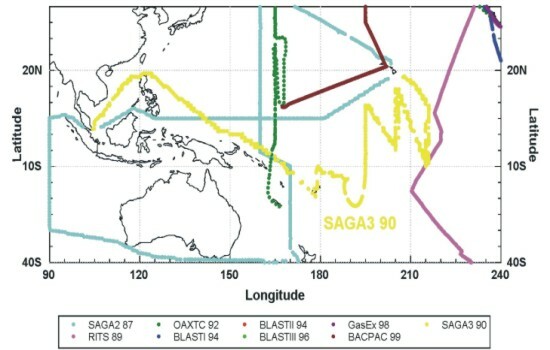 SAGA III is shown in yellow through the equatorial West Pacific Ocean, out of Hawaii and into Singapore. Oceanic Consumption of CH3CCl3: Implications for Tropospheric OH, J.H. Butler, J.W. Elkins, T.M. Thompson, and B.D. Hall, J. Geophys. Res., 96, 22,347-22,355 (1991). 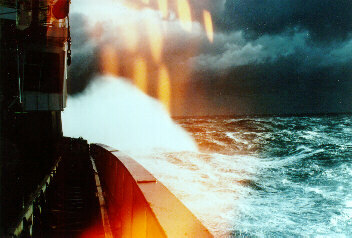 Third Soviet-American Gases and Aerosols (SAGA 3) Experiment: Overview and meteorological and oceanographic conditions, J.E. Johnson, V.M. Koropalov, K.E. Pickering, A.M. Thompson, N. Bond, and J.W. Elkins, J. Geophys. Res., 98, 16,893-16,908 (1993). Data is available on our anonymous FTP account ftp.cmdl.noaa.gov, subdir /hats/saga_iii.